I recently created a Firefox OS app for my favourite radio station — radio paradise. It was a lot of fun making this app, so I thought it would be good to share some notes about how I built it. That was easy! At this point our app is completely functional. If you don’t believe me, checkout this jsfiddle. But please continue reading, since there will be a few more sweet features added. In fact, checkout the short video below to see how it will turn out. Thanks. We’d be happy to have you do that. Our existing web player is html5-based. That might be a place to start. Firefox should have native support for our Ogg Vorbis streams. I couldn’t have asked for a more encouraging response, and that was enough to set things in motion. The first challenge I faced was accessing the current song information. Normally we should not need any special privilege to access third party API’s as long as they provide correct header information. However, the link radio paradise provided me for getting the current song information did not allow for cross origin access. Luckily FirefoxOS has a special power reserved for this kind of situation — systemXHR comes to the rescue. This meant that the app would have to be privileged and thus packaged. I normally would try to keep my apps hosted, because that is very natural for a web app and has several benefits including the added bonus of being accessible to search engines. However, in cases such as this we have no other option but to package the app and give it the special privileges it needs. "description" : "Access current song info on radioparadise.com"
"description" : "Play music when app goes into background"
//NOT working example. Can you spot the error? To my surprise, that did not work, and I got a nice error in logcat about a CSP restriction. It turns out that any attempt at dynamically executing code is banned for security reasons. All we have to do in this scenario to avoid the CSP issue is to pass a callable object, instead of a string. Update: Mindaugas pointed out in the comments below that using innerHTML to parse unknown content in this way, introduces some security risks. Because of these security implications, we should retrieve the remote content as text instead of HTML. One way to do this is to use song_info.textContent which does not interpret the passed content as HTML. Another option, as Frederik Braun pointed out is to use a text node which can not render HTML. One of the great advantages of developing mobile applications for the web is that you are completely free to design your app in any way you want. There is no enforcement of style or restriction on interaction design innovation. Knowing that, it was hard to hold myself back from trying to explore new ideas and have some fun with the app. I decided to hide the settings behind the main content and then add a feature so user can literally cut open the app in the middle to get to setting. That way they are tucked away, but still can be discovered in an intuitive way. For UI elements in the setting page to toggle options I decided to give Brick a try., with a bit of custom styling added. As you saw in the video above, to open and close the cover image I use pan and swipe gestures. To implement that, I took gesture detector from Gaia. It was very easy to integrated the gesture code as a module into my app and hook it up to the cover image. For an app this small, we do not have to use modular code. However, since I have recently started to learn about AMD practices, I decided to use a module system. I asked James Burke about implications of using requirejs in an app like this. He suggested I use Alameda instead, since it is geared toward modern browsers. I wanted to let users choose stream quality as well as whether they want the app to start playing music as soon as it opens. Both of these options need to be persisted somewhere and retrieved when the app starts. I just needed to save a couple of key/value pairs. I went to #openwebapps irc channel and asked for advice. Fabrice pointed me to a nice piece of code in Gaia (again!) that is used for asynchronous storing of key/value pairs and even whole objects. That was perfect for my use case, so I took it as well. Gaia appears to be a goldmine. Here is the module I created for settings. Now we get to the really fun part that is splitting the cover image in half. To achieve this effect, I made two identical overlapping canvas element both of which are sized to fit the device width. One canvas clips the image and keeps the left portion of it while the other keeps the right side. Here is the code for draw function where most of the action is happening. Note that this function runs only once for each song, or when user changes the orientation of the device from portrait to landscape and vice versa. 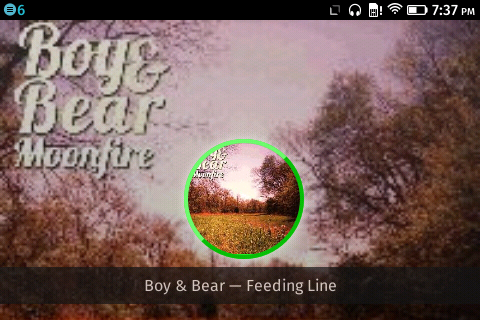 If you have a FirefoxOS device and like great music, you can now install this app on your device. 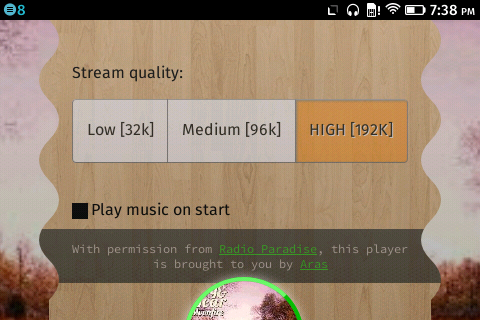 Search for “radio paradise” in the marketplace, or install it directly from this link. You can also checkout the full source code from github. Feel free to fork and modify the app as you wish, to create your own Internet Radio apps! I would love it if you report issues, ask for features or send pull requests. I am more and more impressed by how quickly we can create very functional and unique mobile apps using web technologies. If you have not build a mobile web app for Firefox OS yet, you should definitely give it a try. The future of open web apps is very exciting, and Firefox OS provides a great platform to get a taste of that excitement. Now it is your turn to leave a comment. What is your favourite feature of this app? What things would you have done differently if you developed this app? How could we make this app better (both code and UX)? Aras is an interaction designer and a frontend engineer living in beautiful British Columbia, Canada. He is passionate about the open web and likes to build awesome mobile web apps. You can learn more about him on his blog. Awesome…. :) :) Animation is Simply Superb.. I really like how your app looks in the video. Even after going through the whole article I am still amazed how cool this app looks given the amount of code needed to build it. I also really like your two canvas idea. First time I looked at the video I was really intrigued how you made this splitting effect look so good and natural. If you don’t mind I will examine closely how you implemented this image splitting. I might be able to use something similar in some of my on work. Absolutely! that is the whole idea Ivan. I would be very happy to see similar implementation/variations of this idea. Perhaps after we implement several variations of it, we can look into turning it into a reusable component — if it proves to be useful. Keep me posted. Using innerHTML with unknown content from some site via simple http protocol does not look good. You are vulnerable to access elevation of malicious code. Thanks for your comment Mindaugas. That is a valid concern, and I agree that people should be very careful when using this technique. However, In this case I have trusted in the third party radioparadise which my app depends on entirely anyway. In a way you can say that it is their app not mine, and I think it would be to their best interest if they do not suddenly change the content of that page — which their other apps depend on as well. Also note that because of the CSP restrictions there are no dynamic evaluation of any code. The point is, even if you trust the site now, it may get compromised or spoofed by man-in-the-middle. Arbitrary code will have the same access as your app. I see. Can you make recommendations on how to make this code more secure in case of MITM attack? Is there a way to strip away scripts that may be injected into the HTML content perhaps? I would be happy to update the post if concrete recommendations to improve security are provided. Thank you both for your comments regarding this security issue. I have updated the post to address this. 2. Restricting download when device’s wireless connection is down? 1) This is actually already the case when you user clicks on the radio paradise link in the settings page, I just didn’t show it in the demo. All you need to do in order to open a link from your app in the default browser, is to set target=”_blank”. I believe once the relevant bug is fixed (https://bugzilla.mozilla.org/show_bug.cgi?id=713199) network API will become available and we could add that very useful feature as you suggested. I unfortunately don’t have a FFOS phone to test this with, but what happens when you get a disconnect, can you automatically reconnect? Also, last time I tried simply playing an .ogg stream in Firefox, it would buffer a whole lot compared to e.g. mplayer – can you control this from js? Thanks for your comments Kevin. I try to answer to the best of my knowledge. > can you automatically reconnect? > can we control buffer from js? > Is there a way to ensure you don’t play from an old buffer? The easiest way I can think of to do this is to reset the stream source every time we pause and play which will throw away the old buffer. I am sure there are other ways to do this as well.